A standing seam will elevate the metal joints out of the water drainage plane which facilitates a weather-resistant roof. Metal roof coverings applied to structural roof decks with 3/12 or less slope should always specify a vertical panel joints. These vertical seams may require additional weatherproofing measures in addition to the vertical metal lap. “In-seam” sealant concealed in the vertical lap can help prevent wind-driven rain or pooling melt-water from compromising the joint. A 180° mechanically-folded seam will create a more difficult path for water to follow into the building. A capillary-break within the seam geometry will also make it difficult for water to pass. In cold climates or regions with significant snowfall, the minimum roof-deck slope is often raised to 4/12. Standing seams metal profiles are generally considered better prepared to resist moisture infiltration, however, the design of the joint and anticipated weather conditions are critical design considerations. Warranty, aesthetics, testing performance, and ease of installation are common reasons for specifying a standing-seam roof. Bulb Seam 2.5″ Robust, round interlocking seams. Long panels & expansion ability. Snap-Lok 1.5″ Similar to Snap-Seam above. Several market variations. Note: related metal roof profiles NOT included: trapezoidal seam, batten seam, 5-V-Crimp, corrugated, & other through-fastened panels. Continuous, eave-to-ridge panels can be advantageous at lower slopes as long as the metal expansion is managed. 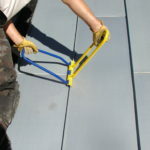 For steep roof pitches with long rafter lengths, shorter panel lengths (often < 15′) will require a traverse seam detail (flat-lock transition to the next panel). Compared to “long-strip” standing-seam installations, this “cross-joint” gives the roof more “character”, texture, expansion control, and ease of handling. Each panel system above has there own panel length limitations. Short-strip standing-seam profiles are more often associated with mechanical-seam (single-lock & DLSS) profiles. See the SSAB website for more information on GreenCoat™ color-coated steel and PLX foldable steel for mechanical-seam profiles. ClickLock is an easy-to-install 1.75” snap-lock standing-seam system alternative to Isaiah metal shingle profiles. Often, a vertical seam profile is more fitting for the design or functionally more appropriate for lower-slope (down to 2/12) conditions. In many cases a project has multiple conditions where a single profile isn’t appropriate. 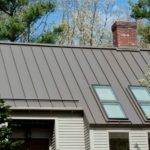 ClickLock allows an architect to specify both metal roofing solutions (shingle & standing seam) panel so the project has a single-source responsibility and warranty. Available in a 12” panel width and continuous lengths (up to 30 feet), ClickLock can also resist wind gusts up to 120 mph and is available in 8 standard colors to complement other Isaiah shingle profiles. photos © SSAB, © Isaiah Industries, & © e-Roof, inc. All Rights Reserved.